Tonight I made a new recipe. Clare had bought some mushrooms the other day, and I bought eggplant yesterday. I thought that an eggplant mushroom ragout sounded good, though I didn’t know exactly what it would entail. I googled it, and found 2 good possibilities. The first possibility, which I did not choose, was more what I would think of as stuffed eggplant. It involved slicing the eggplants in half and filling them. 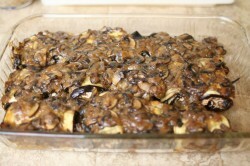 This particular recipe seemed to throw away most of the eggplant flesh though, which seemed strange to me. 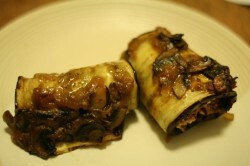 The second choice, which I did make, instead called for rolling up thin slices of eggplant. I decided that the eggplant would taste better this way, so I went with it. Even though it took several hours, the result was very tasty, and worth the effort. I followed the recipe almost verbatim, except that I substituted dried tarragon for fresh basil in the stuffing, since my basil plant is pretty much dead. Clare enjoyed it too, though as I predicted, she wasn’t too wild about the sun-dried tomatoes. She couldn’t put her finger on it until I told her the ingredients though. She also mentioned that I should have put more olive oil on the eggplant, which is correct.